The sound is superb. Even people who don’t care too much about sound quality, like me for example, will be surprised how warm and rich the sound is when you play a record over such speakers. MP3’s are a great invention. It changed my life. Thanks to MP3 (and computers, the Internet, etcetera) I have heard more music in the past few years than in the entire rest of my earlier life. And more interesting music too. But I find it very strange that people accept the poor sound quality of an mp3 as a substitute for a good analog recording. Even regular CD’s are often sounding too thin in my ears. It might be true that our ears don’t detect certain sound frequencies, but it seems other parts of the body do. And be leaving these frequencies out, like is done with CD’s, there seems to be something missing. A certain richness, that is beyond words, but that can be perceived when you here music from an LP played over the kind of speakers that Harrie has in his shop. 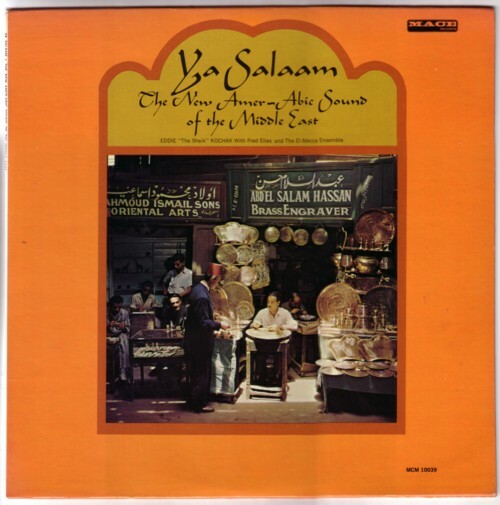 The record that he played for me was an LP of Eddie “The Sheik” Kochak with Fred Elias & The El-Mecca Ensemble, Ya Salaam . Eight songs on this LP are ordinary belly dance music, that can be heard on any of the ten thousand belly dance LP’s that seem to have been made, and which people like you and I only buy for the sleeves. (I love voluptuous women, and especially the kind of women that are often featured on the sleeves of belly dance records I find very attractive.) But both sides of this LP end with a song that is different. I Am not going to try and explain the difference, better hear it for yourself. Here is Eddie “The Sheik” Kochak with Fred Elias & The El-Mecca Ensemble, with Belly dancer .